Relax, unwind and drift back to the days when life moved at a slower pace. Take the time to appreciate the peace and beauty of Mother Nature in a wonderful nostalgic Horse and Carriage Driving experience day. 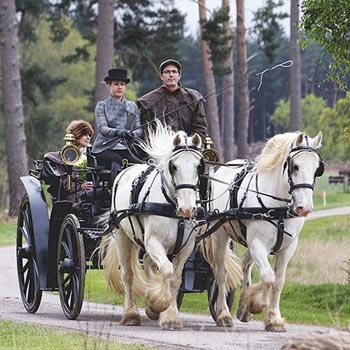 The lovely people at Neddies and Nosebags run several horse and carriage experiences in Gloucestershire. Learn about harnessing your horse and setting up the carriage before driving yourself on a short trip or a longer full day experience. If you yearn for a break from the hustle bustle of the world today, then a Carriage Driving experience is exactly what you’re looking for. Come into a different world where things move at an old-fashioned amble. As your horse walks gently through leafy lanes and fields full of plants and birdsong, feel the relaxation flooding through your whole being as you begin to appreciate the glories of the quiet life, and what a wonderful experience it must have been to live in the age before motorways, cars and lorries. Transportation simply was by horse and carriage, and what an idyllic way that must have been. You can get to know the horses, and on some experiences learn how to harness them and set the carriage up.